10JUN18 – MARBELLA.-IT was perhaps only natural for a man who mostly deals in hat tricks and braces that he wouldn’t just rent one luxury villa for a short break in Andalucia. Fresh from his third Champions League victory in a row, Cristiano Ronaldo scored TWO, not one, amazing homes for the trip to the Costa del Sol. The Real Madrid ace landed one brand new Benahavis villa for his mates and staff and the other for him and his missus, Georgina Rodriguez, 23. The main eight-bedroom home in Zagaleta – Spain’s most expensive luxury private estate – came with a spa, indoor pool and cinema. Security was heightened throughout the stay, understood to be six nights, and photographers were kept out at all costs. “He rented G11 and another one right next door,” revealed an Olive Press source. “Designed by Diego Tobal, they are both on the market for between €11.5 and 13.5 million. “They had only just been finished a few months ago and just furnished,” he added. The Olive Press understands the villas, which would normally rent between €7,000 to €10,000 a night, were acquired via a deal with the Zagaleta owners, who built them. “It’s the perfect coup for Zagaleta, which has now been seen all around the world this week,” continued the source. Ronaldo had arrived via private jet with a group of seven friends and children and during their stay they went horse riding, played tennis and golf. He flew out again on Sunday to meet up with his Portugal team mates ahead of the World Cup later this month. Ronaldo had won his fifth European title as Real Madrid beat Liverpool 3-1 in Kiev two weeks ago. Although he didn’t score during the match, he finished the season as the Champions League’s top scorer for the sixth time running. When contacted about the stay and whether it was paid or not, Zagaleta failed to get back before we went to print. 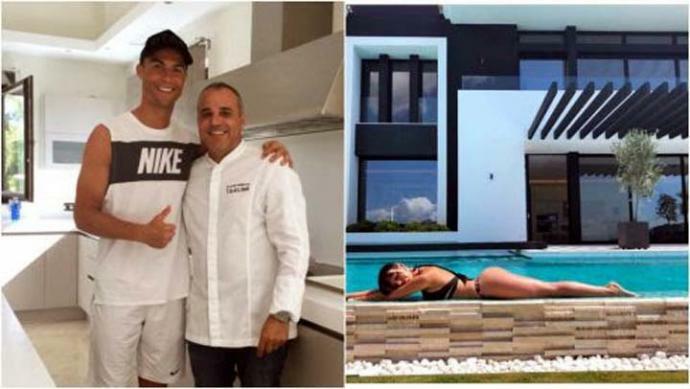 RONALDO hired not one but TWO of the coast’s leading chefs to cook for him throughout his stay. After eating at Dani Garcia’s two Michelin star restaurant in Marbella last week, he was so impressed he hired the chef to cook for him for three days in a row at his villa. During the stay he also hired the services of well-known Japanese restaurant in Marbella, Takumi. The restaurant was clearly rated by the footballer, who asked boss Alvaro Arbeloa to come back twice, and even posed up for a photograph with him at the villa. “It was a great experience and I enjoyed it a lot,” Arbeloa told the Olive Press, this week.